We never quite fell in love with the Lexus RC F. Despite its rich-sounding V-8 engine, its heavy curb weight is one reason it hasn’t measured up with competitors like the Cadillac ATS-V and BMW M4. 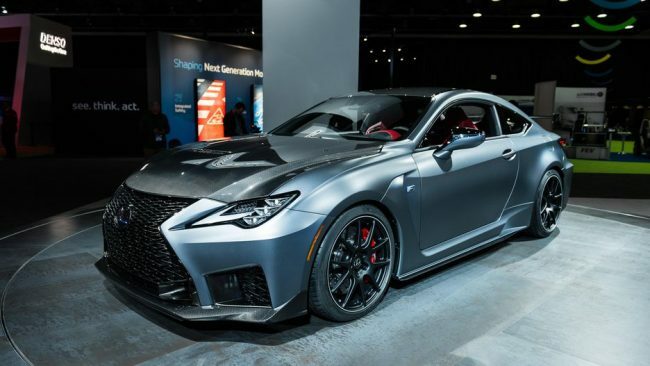 For 2020, Lexus is working to enhance the athletic appeal of the RC F, dropping weight and revising the throttle mapping. It’s also adding a new Track Edition, which we now know will be priced at $97,675. The RC F will reach dealerships soon, Lexus says. Prices for the standard RC F will begin at $65,775. In comparison, the BMW M4 coupe starts at $70,145, and a Competition package adds $4,750. You can now configure the standard RC F online on Lexus’ website. After selecting from multiple paint options—including white, silver, black, red, blue, and yellow—you can choose different leather or leatherette interior schemes. Add the $5,350 Premium package, and you’ll receive heated and ventilated front seats, a rear seat center console with cupholders, blind spot monitor with rear cross-traffic alert, and other features. A $11,400 Performance package will get you lots of carbon fiber, from the roof to the front spoiler, rear wing, and interior. For a much higher sticker price, the Track Edition gets a number of performance upgrades, including a small bump in power. The Track Edition gets 5 extra ponies from its naturally aspirated 5.0-liter V-8 for a total of 472 ponies. Carbon fiber bits help shed extra weight, as does a standard titanium muffler and connector pipes, and lightweight wheels. Inside, the model boasts a red-themed interior with Alcantara accents. Two exterior colors will be available for the RC F Track Edition: Ultra White and Matte Nebula Gray.